I love the last images on this one, simply moons orbiting. I really enjoy that video as well, both for the musical selection and the decision to use the raw images that haven't undergone noise removal and "cleaning". The result is quite eerie and captivating. New findings from data gathered when the Huygens probe landed reveal that the surface of Titan is soft, with a thin hard crust on top, similar to what can happen with snow here on Earth. Huygens also kicked up a cloud of dust-like material into the air when it landed. Would you call snow a dust like material if you kicked up powdery snow and couldn't identify it at first (pretend you're a lander probe)? There is obviously soft material there, the surface is covered with it underneath that thin crust, but there is no binding agent to hold the material together to make snowballs. It would be like extra powdery (dry) now, it would just fall apart to dust. You would have to go to some place on Titan that was wet to have a chance at making snowballs. Agreed with Harbinger there. The word "snow" describes a crystalline solid that precipitated out of the atmosphere, so unless/until you determine that it was formed in that manner, you can't justify calling it snow. According to that article, the 'dust-like material' thrown up by the lander is "most likely organic aerosols that are known to drizzle out of the Titan atmosphere", which in my opinion don't necessarily qualify as snow unless they are crystalline. However, methane snow is a possibility on Titan, at least at certain altitudes where the temperatures are cold enough for methane to crystallize. Analysis of Titan's fluvial valleys also suggest formation by downpours from 'methane storms'. What a crazy world. At the latitude at which Huygens landed (if I remember correctly) it is too warm even for methane rain. Snow would be out of the question at that location. Titan, even though it is cold, is almost too warm for liquid methane, which is the primary reason why Titan's lakes and seas are found almost exclusively at its winter pole. Wow, that's pretty amazing. 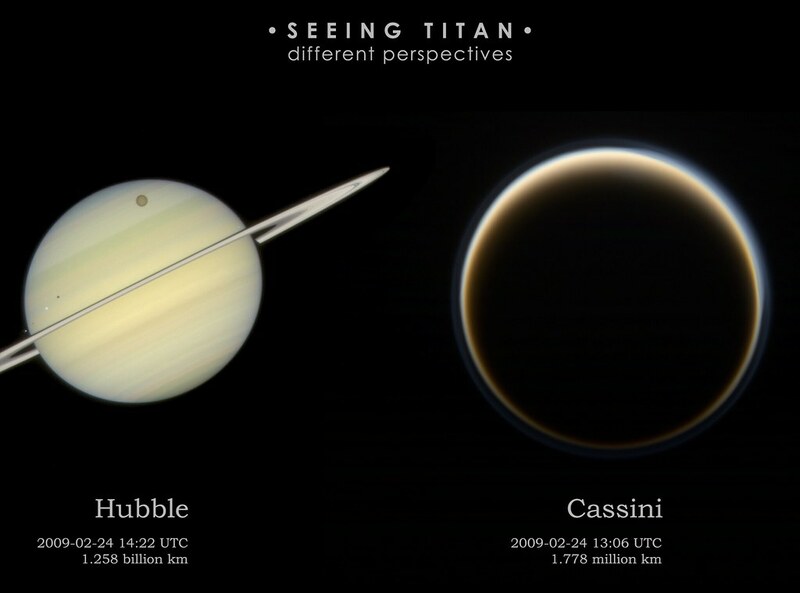 Titan from opposite sides at almost exactly the same time. Great image. Snowballs are easy to make if outside temperature is a little lower than freezing temperature, as under a slight pressure material melts and fuses crystals of ice together. However, if temperature is significantly lower - like, -20 or -30 C for water snow, it is difficult to make one, because snow refuses to melt under pressure and you have to heat it with your hands. I have no details about this stunning image; I found it being used as a background image on the Planetary Society's blog page. 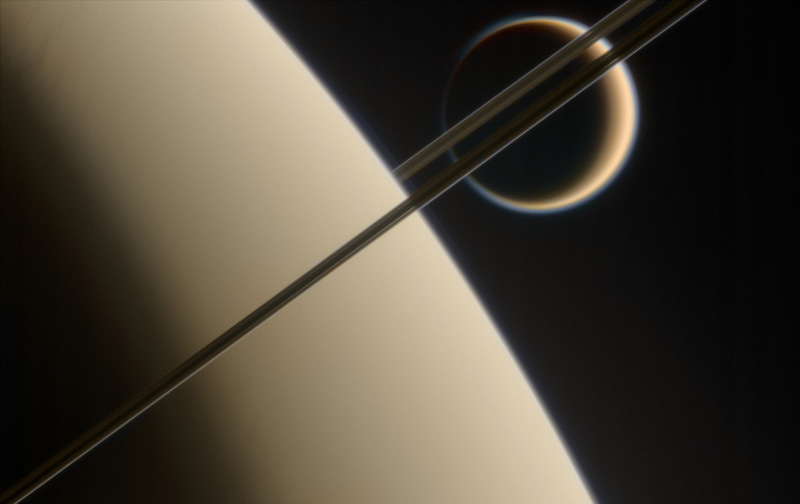 One of the most beautiful image of saturn/titan I've ever seen. Absolutely incredible view of the rings, and perfect composition. Thx for sharing !